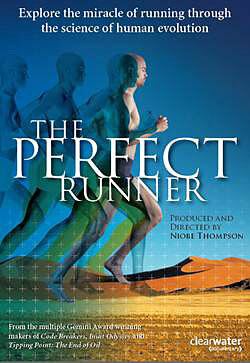 The Perfect Runner will be broadcast on CBC’s The Nature of Things here in Canada on Thursday March 15th at 8:00pm EDT. For more information on other screenings and to buy the DVD, visit the official site. The Perfect Runner (Director: Niobe Thompson): If you like to run, filmmaker and anthropologist Niobe Thompson will take you on a journey to discover your running ancestors in his latest documentary. “What if we had to run before we had to think?” Thompson asks. While many in North America are a long way now from hunting their own food, Thompson searches out some of these endurance runners in action. He travels to northern Russia to observe the reindeer herders of the Siberian tundra, who need to move at the same speed as their animals in order to survive. He investigates Bekogi, Ethiopia, home to many of that country’s best distance runners. And he looks at the phenomenon of ultrarunning, hearing from runners who’ve completed the gruelling 125-kilometre Canadian Death Race. He also takes a look at the barefoot running movement, interviewing Professor Daniel Lieberman of Harvard, whose research focuses on the biomechanics of the human body. Most runners these days wear cushioned running shoes. The shoes are meant to protect us, but they’re actually hurting us. Wearing shoes to run causes our heel to strike the ground first, something that barefoot runners never do. This change to our natural gait has resulted in many injuries, despite the continued “innovation” of the shoe designers. It would have been interesting to see an interview with one of the shoe companies at this point; however, that might have switched the focus of the film too much, not to mention courted some controversy. Thompson prefers to keep the focus on humans as endurance runners, not humans as consumers of brand-name running shoes. Runners (both recreational and elite) will find this documentary interesting and informative, with just enough information to whet the appetite for the science behind running. As for non-runners, it might just entice a few to rise from the couch and lace up. This entry was posted in Documentaries, Television and tagged evolution, running. Bookmark the permalink.